Enough of the dieting and deprivation! It's time to experience the joy of eating well and embrace foods that are nourishing, sustaining, and delicious. 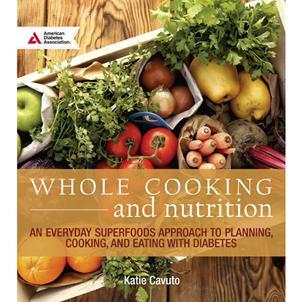 Whole Cooking and Nutrition will inspire you to live a healthy lifestyle and build a positive relationship with food. With more than 150 vibrant, flavorful recipes, this cookbook promotes a mindful, pleasurable approach to eating. Whether you're in the mood for a satisfying breakfast, a bright vegetable or grain dish, a hearty entrée, or a crowd-pleasing dessert, each of these recipes uses fresh, whole ingredients to make dishes that are diabetes-friendly and unbelievably gratifying. Inside you'll find information on living and eating with diabetes, a helpful list of 85 everyday superfoods, and advice that will empower you to eat well and enjoy yourself in the process. By shifting the focus from dieting to loving and caring for your body, Whole Cooking and Nutrition proves that you can cook nutritious dishes without sacrificing taste. I have enjoyed using this whole food cookbook. There are a variety of recipes which assist me with eating tasty and healthy food! I would highly recommend this for anyone wanting to improve their eating.